This last week our cohort all had training in Chisinau with our partners, a Project Design and Management (PDM) workshop where we brought a project idea and worked through different elements of writing a good project. We had three days of this PDM workshop and then two more days of language training.. I'm getting tired again just thinking about it. 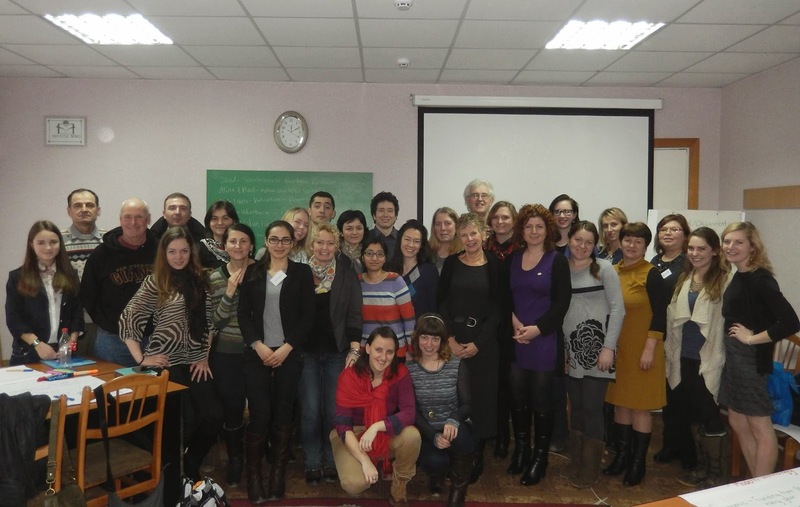 Workshops with Moldovan partners are made significantly longer because of the constant translation that must happen, as the partners don't all speak English. When you understand both languages, it's like you're hearing everything twice so it's kind of exhausting. Plus side, I can no longer tune out the Romanian translation because I understand it, so that's way better than before. For PDM, my partner and I brought our village park renovation project (maybe I've mentioned it before, as we applied for a grant for it a few months ago which we did not get) that she calls "Colț de Rai," which means "Corner of Heaven." Super cute, because that's how we all are in Caplani, obviously. There were sessions on writing a needs statement, making goals and SMART objectives, writing budgets, monitoring & evaluation, fundraising, sustainability, and more. I think a lot of the sessions were really valuable for my partner, and having other people there to help explain things in her language was so helpful. Hopefully it will make our project a lot better! And sessions about going to Dracula's castle. Just kidding, it was a metaphor. It was also (obviously) good to see everyone again. For most of the workshop, I sat at a table full of cool PCVs who are great at Romanian, which was excellent when we all needed to communicate and do group work with our partners, two of whom do not speak English. After PDM was over, we moved from the hotel to apartments in the city for two full days of language IST. It was a lot better than some of us expected it to be! I think I might even be able to start using the "new" grammar stuff that we learned in September but that I had been neglecting until now. So that will be good. I got to ask my 100 questions/hour and have them all answered! I sometimes feel I should apologize to my classmates for the absurd number of questions I ask, but.. Hopefully the answers help them, too! So I'll keep asking. On a non-IST side.. I got to see my friends and spend time with great people! We played Джанга (aka Jenga in Russian) at a restaurant where the waiters wore lederhosen aprons, we met Moldovans who wanted to go bar hopping with us, we stayed up too late (why go to bed when you're having fun?! ), and there was just a lot of enjoying each other's company in general. Not every day is a great day, but some nights are extra great, so maybe that makes up for it. I'd say that if I were ranking my evenings in Moldova, after this weekend, I could add another one to the top 5. Now I'm back to site, hard at work.. My to-do list is suddenly miles long (it's normally rather short) so that's going to be interesting. Hopefully it will be the good kind of busy over the stressful kind, though I suspect it will end up some of both. Today Iana and her friend Madelina walked me to work. Iana was precious as ever, telling me I'm beautiful, asking how the Primaria is, asking me what my favorite flower is, and being so proud to tell me about the 9s she got in school (10 is highest). Today I learned that I need my passport to pick up a package (books in English for the kids!) at the Poșta. Today they told me that they want me to teach the nursery school kids something "American" for the International Women's Day program. That will be an adventure. Today the sun lasted SO LONG and I got to almost finish my book without turning on the light. If you're keeping track, I've now hit 8 months in country. CR-A-ZY! Can hardly believe it.